If you guys follow my blog, or Instagram, you will know that I just got back from a one week vacation in Mexico. One glorious week. The sun, the beach and total relaxation for seven full days. It was totally what my body and soul needed. However, before going on this vacation I was pretty nervous about the food situation. 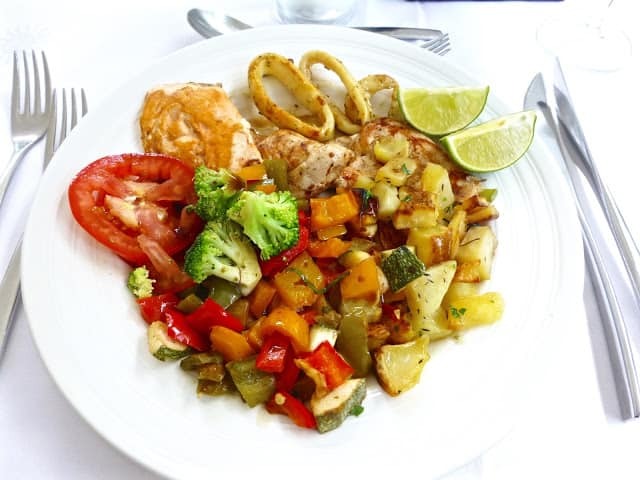 The place we stayed, the Bahia Principe in the Riviera Maya, was an all inclusive resort and this was the first time in over five years where I would be giving my food control up for an entire week. Needless to say I was pretty terrified. It’s pretty impossible to pack a back-up supply of safe snacks that can last an entire week. Probably not completely impossible, but pretty tricky if you want to pack anything other than food that is. And given my pension for pretty dresses and bikinis there was no way I will filling my suitcase with only food items. I know, priorities right? So how did it go? Actually pretty good I am pleased to report. There was one slip up where I attempted some gluten free bread two nights in a row. Turns out my body still isn’t ready to handle corn flour (and who knows what else was in them). Lesson learned my friends. Lesson learned. And yes I realize that in no way are gluten free buns made with corn flour a paleo friendly food item. They just looked so good, and the restaurants prepared them specially for me, so I didn’t want to say no. It get’s tiring being “that girl” who can never eat anything. And like many of you, my food intolerance symptoms don’t typically show up for 24-48 hours so I realized my mistake a of couple days later. I actually thought I might have gotten away with it initially. Sadly no. Fortunately, I brought lots of activated charcoal with me, just in case something like this happened, and like always, it worked its magic. However, besides that, the food situation was actually much more paleo friendly then I ever would have imagined. And the hotel was very accommodating to my needs. 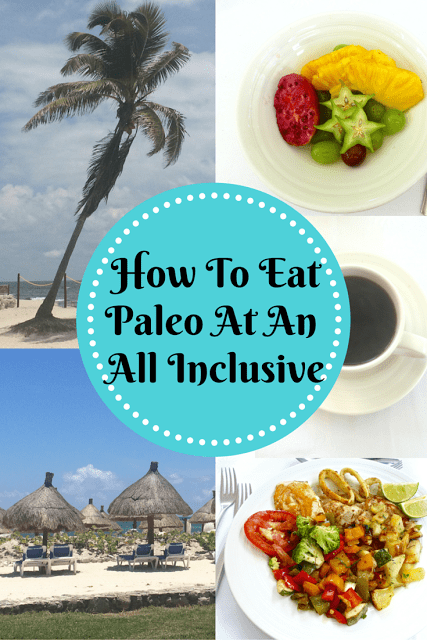 So to help those of you who may be planning trips to all inclusive resorts I have put together some tips on How To Eat Paleo At An All Inclusive Resort. Considering that I only speak un poquito espanol there was no way I was going to be able to explain my food restrictions to the food service staff at the hotel. Not with any success anyways. This is where getting help is crucial. It turns out that most all inclusives will have a concierge that can help you with pretty much anything you need. 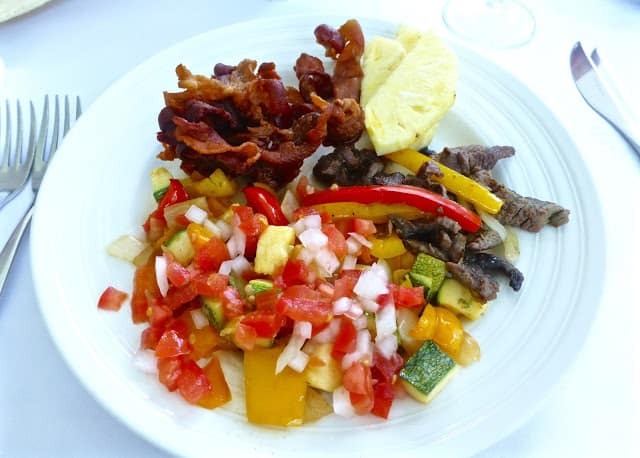 Since Erik arrived at the resort before me he had already discussed my “special needs” diet with our concierge and she went out of her way to prepare a letter in Spanish to take with me to all the restaurants and buffets. Since I realize that you can’t outline all the restrictions of the paleo diet in a letter, mine explained that I cannot eat gluten, dairy products or soy products. This covers my main food issues, and usually beyond those I am alright. I realize this leaves me open to things like refined sugar, legumes and potentially other grains, but for the most part I don’t find it that difficult to get around those items. This letter turned out to be invaluable. Whenever I showed up to a buffet, one of the chefs would lead me around the dishes telling me which ones were safe or not. The same went for the restaurants. The service staff were very diligent to let me know which dishes would be safe or not. It was more than helpful. It would be nice to say that I ate a ton of rich food dripping in delicious sauces, but we all know that would be a lie. I find the easiest way to avoid food mistakes is to skip the sauces. Now I am not saying you have to avoid all sauces, for example, things like guacamole and tomato salsa are everywhere in a Mexican resort, and I more than took advantage of these, but in general if a vegetable or meat dish comes with a sauce I usually ask them to leave it off. Often these things contain ingredients that you will want to avoid, like corn starch, refined sugar, alcohol, vegetable oils etc etc. Now if you tolerate these things and don’t mind eating them once in a while then by all means go ahead, I just don’t do well with them. Now I realize that for most people, half the fun of going to a Mexican resort is the unlimited amounts of free alcohol. Unfortunately, most drinks contain all sorts of sugary chemicals that just don’t fit into a real food diet. Now I actually don’t have a problem with the alcohol (we can debate whether alcohol is really paleo at another time) it’s just the ingredients the alcohol is mixed with that you need to be cautious of. Think pop, pre-mixed juices, refined sugar etc etc. Things that my body (and probably yours) just doesn’t like. So I am not saying you need to avoid alcohol on your vacation altogether, just be smart about the drinks that you choose. My drink of choice is a dry white wine. But you may like something on the rocks. Or mixed with a pure juice such as fresh orange juice. Whatever works for you. As I always say, there is no one size fits all diet. Yes I know this is a sad one. And this one may depend on the resort you are at, but I was pretty limited in my dessert choices. Basically it was fresh fruit, or fresh fruit. Now I actually love fruit so I didn’t mind this but just beware that there weren’t even any gluten free options at my resort. The one item that they did have which I tried at a couple places was fruit sorbet. Mango, lime and hibiscus. Now, again I know that these are not purely paleo friendly items since they do contain sugar, but I can actually have small amounts and be fine. And they were so good! So if you do have a sweet tooth and don’t want to go completely without a real dessert on your vacation I would recommend packing some chocolate or some other little delight in your suitcase. Then you don’t have to feel left out. Alright, so with all those tips in mind, what did I actually eat do you ask? Lots! I will break down my typical meals from the week to give you some inspiration. One word: bacon. Lots of bacon. I actually had bacon everyday that I was away. Now I would not recommend this as a long term breakfast plan, but for one week I was more than happy to have my daily bacon fix. There was also usually one other meat dish that I could eat, either chicken or beef fajita filling (just grilled meat and peppers). I also always had some fresh fruit, cooked plain vegetables of some kind, and on some days baked potatoes. For some fat they always had olives, olive oil and guacamole. Oh and coffee. Of course coffee. There was also a juice bar with freshly made juices including some delicious combinations like grapefruit, orange and cucumber or apple, carrot, celery and mint. Everyday there were new options and everyday I tried a new combination. And while I don’t eat eggs, there was also usually hard boiled eggs, and a whole omelet station where you could get an omelette made for you. Needless to say I did not go hungry at breakfast. Lunch was actually a very easy meal. At every buffet they always had a whole section of meat and seafood that were simply grilled in olive oil. No other sauces or ingredients. I had a selection of calamari, mahi mahi, salmon, tuna, chicken, steak, lamb or pork depending on the day. For vegetables there was always at least one cooked vegetable dish with no sauce, including broccoli, carrots, mixed vegetables, potatoes and peppers. There was also an entire salad bar with a ton of raw vegetables to choose from. And for sauces again there was guacamole, salsa, olive oil (including many flavoured ones) and balsamic vinegar. And I always ended my meal with fresh fruit, or a fruit sorbet. At our resort we had a choice of either making reservations at a restaurant for dinner, or going to the buffet. For most nights we went to one of the restaurants, but on the nights we went to the buffet, the options were very similar to my choices at lunch so again I had many choices. The restaurants were a little more limited but there was not one place that I couldn’t eat. 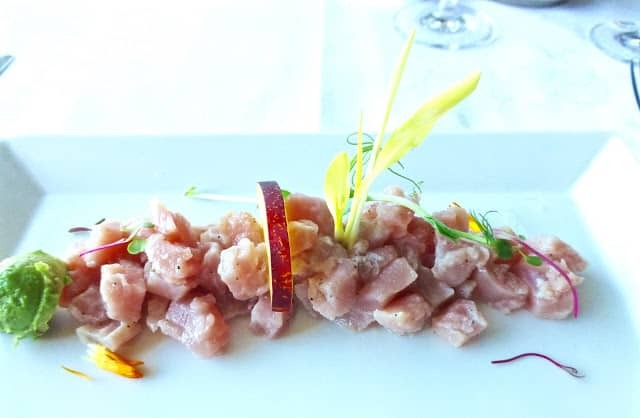 For a starter I usually had a salad of some kind, or a fish tartar dish. Most of the soup dishes I could not eat as they involved dairy of some sort so I simply skipped that course. Then for my main dish I had steak at most places as that was usually the easiest to modify, but I also ate duck one night and lamb another. Again I simply asked for no sauce, and a side of cooked vegetables. Simple but still tasty! And again for dessert it was either fresh fruit or a fruit sorbet. 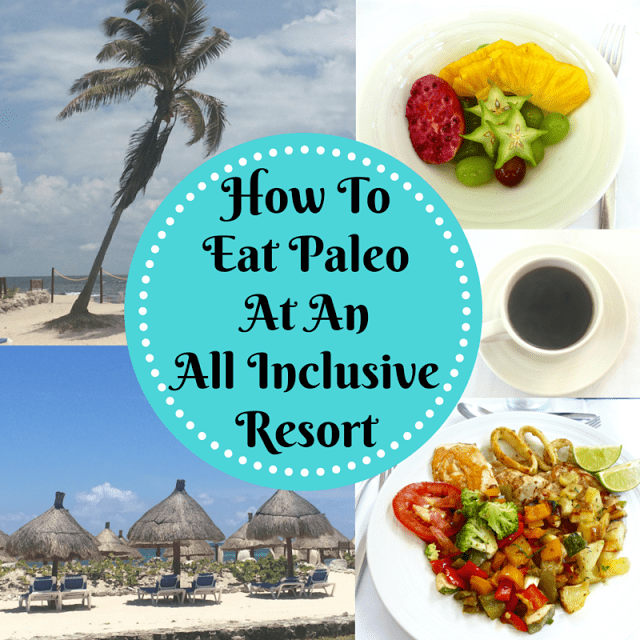 Alright friends, there you have it, my tips for eating paleo at an all inclusive resort. I hope you found this helpful! I should just say that by the strictest paleo definitions, I am sure the food at resorts does not comply as I doubt the meat is pasture raised, the vegetables grown organic, the salt used is real sea salt etc. However, I know that many people (including myself) follow a more flexible paleo lifestyle, and if that means I get to go on a Mexican vacation I am more than willing to give up some of the strict paleo rules for seven days. But that’s just me. Again, you know what your body needs so always listen to it first.